I love a good tradition. My childhood was filled with countless traditions and rituals. Pancakes on Saturdays, eating lunch at the same grimy pizza place on the way to our winter condo, dinner out on Fridays, summer weekends at the cabin—my family loved a good rhythm. Once we did something twice, we didn't change it. We developed so many traditions that my best friend wrote her senior thesis about us. December was license for our family's tradition overload: sledding parties, bon-bon making, midnight ice-skating, hiding baby Jesus from the advent calendar, gingerbread houses, presents on Christmas eve, sleigh rides, a Christmas village, last-minute shopping for mom's gifts, Home Alone 2, steamed pudding, and even a New Years' Eve party. We packed it in, adding more as we went along. It was fun, but frankly a bit exhausting. After I got married, we tried to develop our own traditions, but things fell a little flat just the two of us. I assuaged my guilt with promises to do more when we had kids. I have 3 little boys now, and we are starting to create a new Christmas rhythm. We are building favorite traditions and scrapping others as we go. As a mom, I tend to get worked up and overworked trying to create magic for my little ones. But there's no lasting magic in making candy cane wreaths or seeing Christmas lights. Perfectly-wrapped presents under a flawless tree are not a Christmas miracle. The magic of Christmas is Jesus, fully God coming to earth as fully man. It's the Word, Jesus, becoming flesh to dwell among us. The Christmas miracle is the Son of God coming to earth to take all of our sin and shame so we can stand pure and sinless before God's righteousness. This year, instead of stressing out about the perfect house, the perfect presents, and the perfect traditions, I want to stress to my children that a perfect God became a perfect man to save them from all their imperfections. I'm not convinced that Christ cares much about a holiday. He cares about us filling our souls with more about his goodness and letting the resulting joy overflow to our children. Because we can't add to Him or take away from Him. And we don't need to. Here's my plan: every day of December, I'm going to seek to learn more about Jesus. Doesn't have to be a new idea, but I have to really learn it. I'm going to dive into the Gospel of John and camp out on the "I AM" statements of Jesus. Who better to tell us about Jesus than the only true expert? I'm going to meditate on each "I AM" statement for a few days, and if that isn't enough, I'll give myself the extra time I need. There aren't specific rules, it's just Jesus. There will be failures. I'm not perfect at anything, and I certainly won't be perfect at this plan, as simple as it is. God doesn't need my perfection to work; He's got perfection in the bag. I'll give Him my humble best, and I know that He'll bless it. More of Him is always His will. As I make space in the busy of Christmas traditions for more Jesus, my children will receive the overflow of my transformed heart. I think they'll see less perfect-Christmas Mommy and more Jesus. I'll be checking back in here at least once a week with what God is teaching me and posting shorter moments on Instagram using the hashtag #justJesusadvent. I'm sure there will be a couple periscopes involved too. 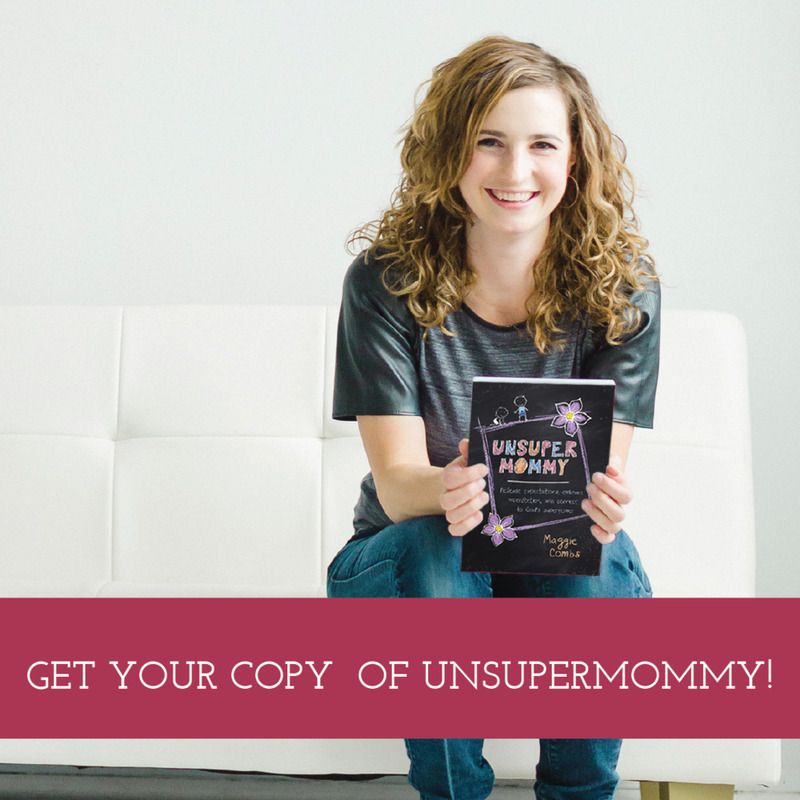 Follow me @UnsuperMommy or friend me on facebook if I don't know you yet! I'd love to have a few friends join me in the simple goal to know Jesus more this Advent. This isn't an Advent challenge to complete. It isn't a tradition to exalt. It's not a perfect plan. It's how I'm trying to hold Jesus high above the trappings of the season in my own home. Make up your own plan or hang with me in the I AM statements, but don't slide through Christmas knowing more about shopping, baking, decorating, and hosting, without receiving the surpassing greatness of knowing more about Jesus. If you gain one thing this season, make it more of Jesus. Just Jesus. Anyone else in?